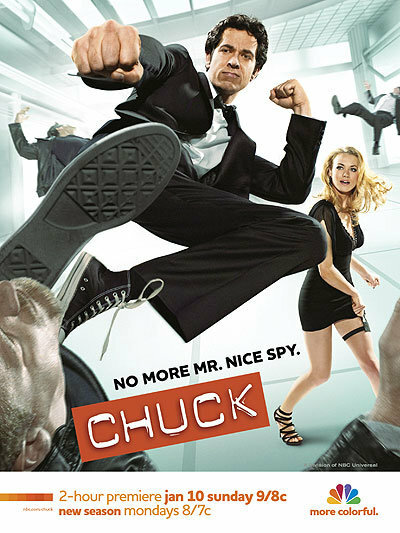 Chuck season 3 starts this Sunday, January 10, on NBC! It kicks off with a two-hour premiere from 9pm-11pm EST, then will return to it’s usual Monday 8pm time slot. I can’t wait! It’s been a long road getting here, but we’re finally in store for some Chuck-tacular adventure! Below is an extended season 3 preview (running time 5:56) to help get you in the mood. Very cool. Looking forward to it. This is a dynamite show! Full of geek references like you wouldn’t believe. I cannot say how great this show is. So I won’t. I watched the 2 hour season premier and I have to say… Ehhh… I get that it was trying to wrap up a bit on the end of last season but it was a bit much and WAY over acted than in previous seasons. That said, EP. 3 was WAY better – more along the lines of previous Chuck’s. I like that they are treating him more like a “spy” and he is accepting of that. The whole flashing on a skill, however, could get old fast. What’s up with Chuck’s hair!?!?! It’s been combed or something. Bring back Bed-Head Chuck!